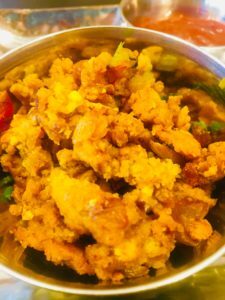 Traditional Stuffing with Spiced Paneer – Welcome to Creative Rajni! Stuffing at a thanksgiving table is a must. Here’s my creation – a stuffing recipe with spiced paneer(Indian cheese). The breadcrumbs are mixed with very flavorful vegetable broth along with spiced paneer, onions and celery. The soft bread and paneer along with crunchy celery is a party in the mouth. Heat a non stick pan and add coconut oil to it. Once hot, add in the red onions and saute until translucent. Now add in celery, ginger and garlic and saute for 3 minutes. Add in the cumin and coriander powder and paneer cubes and mix well for 30 seconds. Add in the stuffing mix and stir. Add in the vegetable stock slowly 4-5 tbsp at a time until the stuffing mix is well hydrated with the stock. Fresh coriander leaves can be added at this point and stir. The stuffing is ready. Heat a deep saucepan and add whole milk to it. Once the milk starts heating up and just before boiling add in the lemon juice little by little stirring continuously until the milk separates. Add in the lemon juice until you see a greenish liquid. Stir well and drain the green liquid using a cheese cloth. So you have the separated milk in the cheesecloth. Now place the cheesecloth on a flat surface.Put a flat lid on top of the cheesecloth and put a heavy weight on top of this flat lid. Keep this in the refrigerator overnight. Next day remove the cheese cloth and cut the paneer into small cubes or into any size that you prefer.